Chhatrapati Shivaji Intl. - Suvarnabhumi Intl. 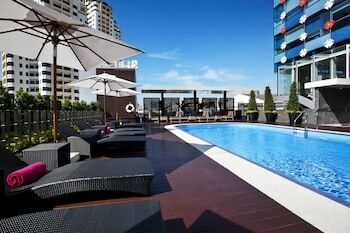 Have you thought about locking in a Bangkok holiday package? It's a breeze with Expedia, and you'll be able to buy some nice meals or gifts for your friends back home with the money you save. Wouldn't it be nice to earn savings up to 21.4%*? Purchase your group's package deal on Expedia today! With more than 400 partner airlines and 321,000 properties to mix and match from on our extensive database, you won't have any problems crafting your perfect holiday. Not 100% sure about your booking? There is no extra fee from us for changing almost any reservation. 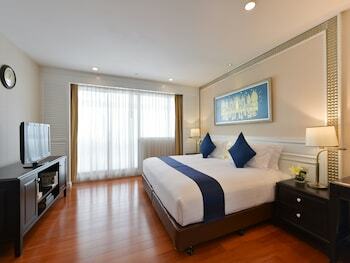 Almost ready to go on your Bangkok holiday? Can't decide what things to include in your travel itinerary? No need to fret — we're here to give you a few of our recommendations. With such a range of world-renowned attractions in one place, you'll never have a dull moment in Bangkok! First things first, be sure you get some selfies in front of Grand Palace and the Wat Pho. After you've ticked those off, you'll still have the Wat Arun and the Temple of the Emerald Buddha to visit! 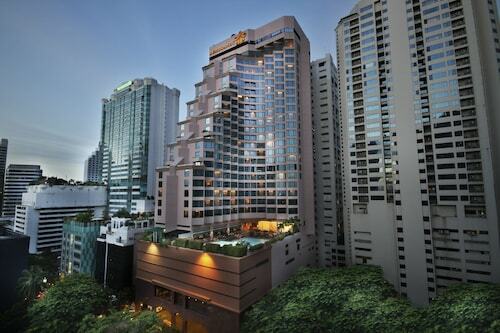 You'll find yourself surrounded by fabulous attractions, such as Siam Square and Jim Thompson House. If you'd really like to make the most of your time here, also drop by Chatuchak Weekend Market and Patpong Night Market. Got cash to spend? Search for unique keepsakes and score some choice bargains at Pratunam Market. Visitors in this destination have an abundance of choice. Temples have long appealed to pilgrims seeking spiritual enlightenment in a complex world. Explore the holy site of Wat Saket and have your own mystical experience. Still got time to spare? Built to honour the gods, temples offer a captivating peek into another culture and religion. Learn about the local faith as you wander around the sacred monument of Wat Suthat. We all know you don't take time off work just to sit in a small seat on a plane and sleep in a strange bed. Travelling is all about the exciting adventures you have while you're away! For a comprehensive list of activities, take a look at our Bangkok things to do page. Got Bangkok in your sights? 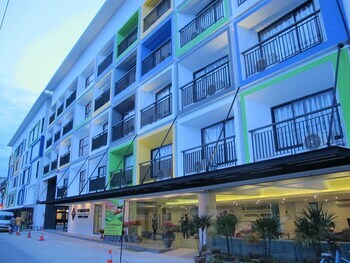 You're travelling to the capital of Thailand, so you'll definitely have a huge range of accommodations to select from. 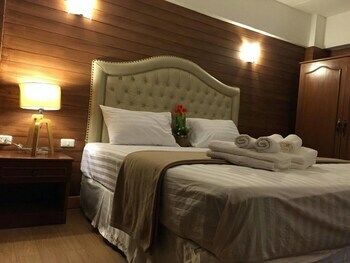 Book your room today on Expedia for the best rates on luxury getaways and cheap holidays! It's not every day you get to spend time away, so why not spoil yourself and spend an evening in a fancy room at the Mandarin Oriental, Bangkok (48 Oriental Avenue) or The Siam (3/2 Thanon Khao)? With exceptional service and first-class amenities, you'll feel like a movie star! Looking for somewhere a little lower priced? The InterContinental Bangkok (973 Phloen Chit Road) and the Ibrik Resort by the River (256 Soi Wat Rakang, Arunamarin Rd) are a couple of places that won't cost you a fortune. When you're exploring Bangkok, you can't skip Grand Palace. The Chakrabongse Villas is just 0.5 miles (0.8 km) away, and the Arun Residence is 0.4 miles (0.6 km) away. If you're coming in by plane, you'll most likely be disembarking at Don Mueang International Airport (DMK). After you've retrieved your bags and exited the terminal, downtown Bangkok will be just 13 miles (21 km) away. 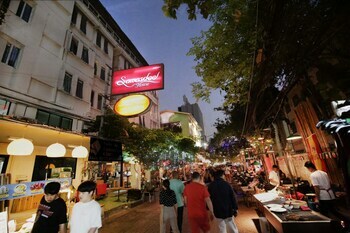 Khao San Road epitomises the manic mega-city, attracting tourists and travellers from all over the world with the promise of cheap accommodation and adventure. A series of sparkling golden rooftops crown the Grand Palace, which reigns supreme along the banks of the Chao Phraya River. Named after the Hindu God of Dawn, Wat Arun is a sight to behold both as the sun rises and as it slips below the horizon. Book yourself in for an energising treatment at the official school of traditional Thai massage, housed in Bangkok’s oldest temple complex. Time stands still at the home of James H.W. 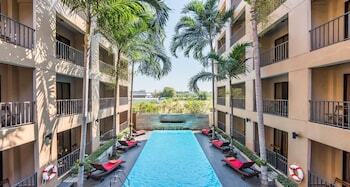 Thompson, a beautiful example of classical Thai architecture surrounded by landscaped gardens and tropical foliage. The holiest Buddhist site in Thailand, Wat Phra Kaew is home to the revered Emerald Buddha which is protected by mythical Guardian warriors at every entrance. In a city as busy as Bangkok, the green spaces and tranquil lakes of Lumphini Park provide respite from the frenetic pace of the outside world. Constructed to appease the evil forces at a local construction site, the Erawan Shrine is now a revered local landmark believed to bring peace and prosperity. Combining traditional Thai construction with European design, the royal residence of King Rama V is an architectural delight set in extravagant grounds and gardens. The shaded terrace of the Golden Mount at Wat Saket offers up a sensory feast, with an unparalleled panorama of Bangkok accompanied by the ringing of brass bells. Discover amazing artefacts from every era of Thai history at the National Museum Bangkok, which hosts an impressive array of art, craft and architecture. Find where famous writers had their hangouts and browse the stalls of the floating market in the River of Kings. 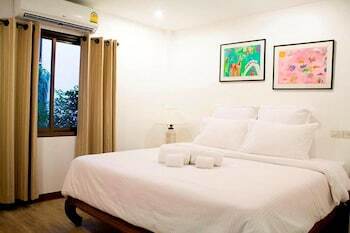 This family-friendly Bangkok hotel is located on the riverfront, within a 10-minute walk of Bangkok Riverside and State Tower. Iconsiam and River City Shopping Complex are also within 1 mile (2 km). Saphan Taksin BTS Station is only a 3-minute walk and Surasak BTS Station is 12 minutes. 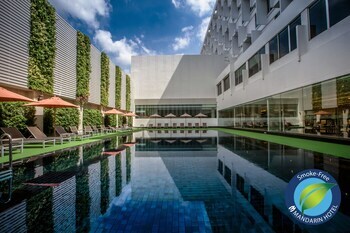 Located in Sukhumvit, this luxury hotel is within a 15-minute walk of Soi Cowboy, Terminal 21 Shopping Mall and Emporium. EmQuartier and Nana Square are also within 1 mile (2 km). Asoke BTS Station is 10 minutes by foot and Sukhumvit Station is 12 minutes. 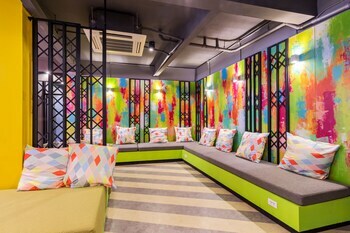 This family-friendly Bangkok hotel is located in the business district, within a 10-minute walk of Terminal 21 Shopping Mall, Embassy of Argentina and Embassy of India. Embassy of Pakistan and EmQuartier are also within 1 mi (2 km). 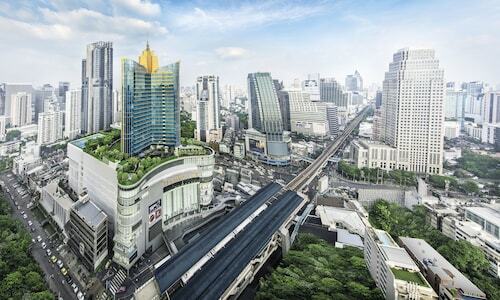 Asoke BTS Station is only a 2-minute walk and Sukhumvit Station is 4 minutes. Located in Bangkok City Centre, this spa hotel is within 1 mi (2 km) of Lumpini Park and MBK Center. Siam Center and Pratunam Market are also within 3 mi (5 km). Sam Yan Station is only a 4-minute walk and Sala Daeng BTS Station is 14 minutes.